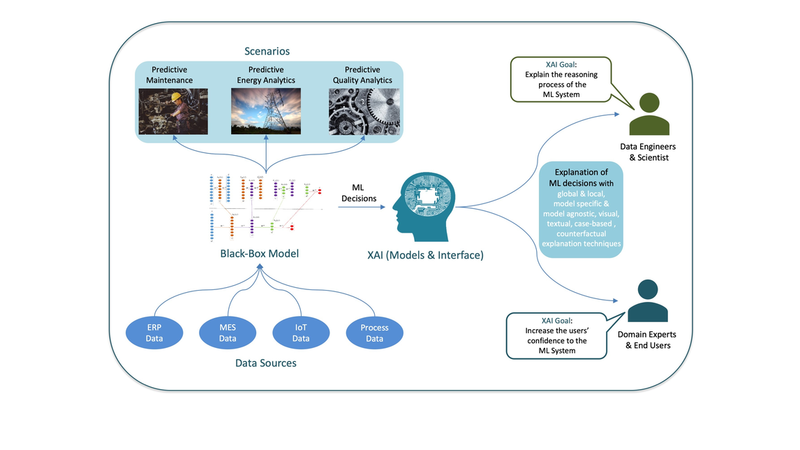 AI-based decision aids help subject matter experts as they make judgments in the context of their operational activities, especially, when complex information and systems are involved. The targeted use of data-driven decision making can lead to significant productivity gains in the manufacturing sector - assuming a successful operationalization and embedding of the cognitive insights into the business processes takes place. Such integration requires a change management process, which builds trust in the actions, inference mechanisms, and results provided by the deployed AI systems. Although AI models are becoming increasingly precise, their "black-box-character" still poses a major obstacle for practical acceptance and use: So far, they provide little explanation to the experts about how the results and recommendations are reached. However, for a smooth deployment of the AI systems and their acceptance by the experts, it is essential that results be comprehensible, in other words, explainable. Explainability is seen as a way to increase user confidence in the models. Nevertheless, explainability is not a clearly defined term: it encompasses many different dimensions and goals. The quality and adequacy largely depend on the situational context of the decision and the characteristics of the user.